Scranton nursing has been a big part of the Scranton ROTC battalion. It allows students to partake in 2 very important and unique organizations. 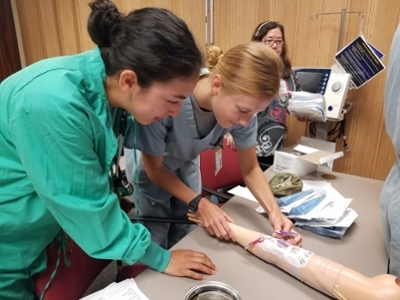 Part of the ROTC program allows rising senior nurses to have a nursing internship in the summer. The University of Scranton offers their students the opportunity to use this internship as direct nursing credits, something unique to our program. Scranton nurses have had opportunities to go to Hungary, Mozambique, Airborne School, Uganda, Texas, and Hawaii among other places. For more information about the program please contact Bill Ramsey at herbert.ramsey@scranton.edu.